With 22 years of experience, WildWood Properties offers a host of home services inside and outside to make life easier, protect property, and even provide a great getaway vacation in Maine. Rick Drapeau and his wife Anne have recently expanded WildWood Properties to include property management services as well as vacation rental management. WildWood Properties takes care of year round management for properties from camps and seasonals to associations and neighborhoods. They watch over the inside to make sure that there are no issues, like leaking water or a light left on. If there is an issue, they will fix it or call in someone within their network of subcontractors to fix a plumbing issue or an electrical issue. “We don’t pretend to know that stuff,” Rick said. On the outside of the property, WildWood maintains the lawn, shrubs, waters flowers, whatever might need to be done to keep the yard ready for the next impromptu or planned gathering. They go above and beyond with extra details to make sure your property stands out and is one that neighbors will envy. New this year, WildWood is helping clients rent their properties and find renters to enjoy time in the Sebago Lake region. They handle all of the interviews, any issues that might pop up and clean the rental at the end of the week. “We do all the leg work and the property owner gets a statement,” said Rick. Rick is also a licensed Realtor® and associate broker through Better Homes & Gardens Real Estate, The Masiello Group; and he can help people buy and sell their dream homes, be it a primary residence or a condo on the lake, investment properties or a small camp. 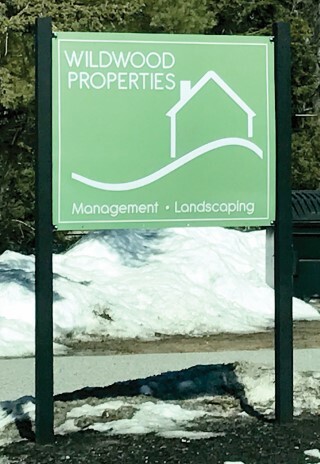 With a new logo, sign and an office just off Tandberg Trail behind Better Homes & Gardens Real Estate, right near the corner of Route 302 and Route 115, WildWood Properties encourages potential and existing clients to visit them to see what WildWood Properties has to offer. They are still masters at landscaping and gardening. The company employs eight people including landscapers, arborists and horticulturalists for all the clients’ growing needs. They also provide hardscaping – creating masterpiece rock walls, fire pits, retaining walls, planter beds and pool patios. WildWood Properties is now scheduling for spring clean ups and is currently working around the snowbanks to do what can be done now. Rick predicts the snow will be gone in two weeks and he knows that his clients will want the job done the day the snow is gone. He will try to meet that expectation. When the snow lasts as long as it has this year, tasks like mulching, mowing and clean up all blur together for the team. “We have 45 days to do all of it,” Rick added. For the do-it-yourself, they will also deliver bulk materials such as mulch, compost, super soil and stone from their supply yard. They concentrate their business in Windham, Raymond, Cumberland Foreside, Portland, Gorham, and Naples - up to the causeway and Frye Island. For more information on WildWood Properties, to schedule a spring clean-up or to rent a lakeside cabin for a week, call: 207-894-4254 or visit: www.WildWoodPropertiesInc.com, or email Rick@WildWood PropertiesInc.com. They are also on Facebook, LinkedIn and Instagram.